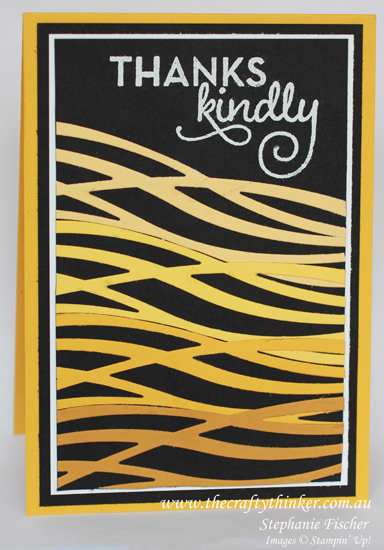 This is such a quick and easy card but, thanks to the Swirly Scribbles thinlit, still has wow factor. I cut the panels to size first and cut and folded the Crushed Curry card base. Starting at the bottom, I glued the shapes to the panel - overlapping them a little on the left side. I then white heat embossed the greeting from One Big Meaning. I trimmed around the panel with a pair of snips to remove the excess Swirly Scribbles and then adhered the layers to the card base. This card is entered into the Crazy Crafters Project Highlights this week. Click here to see the other great projects and vote for your favourites!